There’s no outgrowing it. It’s not a childhood disease. It’s for life. If you have it now, you will have it tomorrow, and next week, and next year, and next century – should you be lucky enough to live so long. I’ve had several people tell me, now, that they had celiac disease when they were kids, but they outgrew it. And it drives me bonkers. I try to tell them, no, you should get checked. But they don’t want to hear it. They are absolutely confident, in a way only the blindly faithful can be, that they do not have celiac disease (and I have been guilty of this, too). And meanwhile they have any of a dozen different symptoms that can result from celiac. I feel like I’m watching someone drowning, and I’m reaching out to grab them and drag them back to shore, but they keep telling me, No, no, the water’s warm. The medical establishment did believe celiac was only a childhood disease and that you could grow out of it. And that belief has lingered on for decades. As recently as 2004, some medical schools were still teaching that. Many doctors still believe everything they were taught about celiac back when they were in school. They may call it sprue instead of celiac, but it’s the same thing. Here’s why the belief has stuck around. 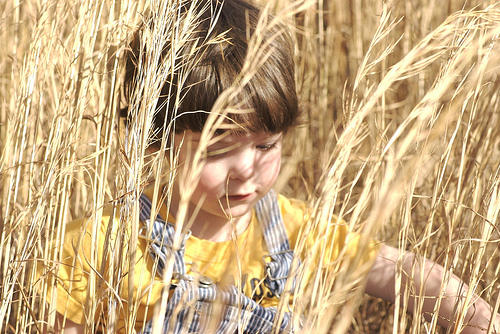 Children diagnosed with celiac were put on gluten free diets, and they improved. After a few years of that, doctors would tell the kids it was okay to go back to eating gluten. So they did. And, because their intestinal villi had healed in the intervening years, for a while they were fine. They didn’t have the debilitating intestinal symptoms anymore. And those specific symptoms may never have come back. At which point, the doctor declares the kid cured. You no longer have celiac disease, congratulations! But the kid starts racking up symptoms that aren’t obvious. Maybe the kid doesn’t grow quite so tall as his siblings. Or maybe puberty hits a little late. Or maybe a girl has really irregular periods. Or maybe the kid gets eczema. Or migraines. Or constipation. Or weight gain. Or frequent bronchitis. Or maybe the kid seems asymptomatic for a very long time. None of those things is obviously celiac related. Here’s a list of classic and less well known symptoms, and I certainly haven’t covered everything. 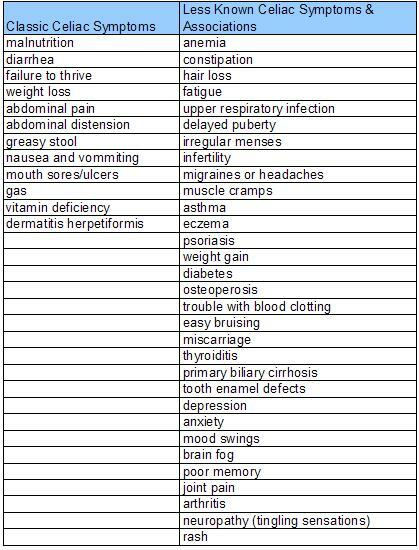 The cloud of possible symptoms is huge, and there are a lot of other possible causes for all of them. Any illness that can be caused by nutritional deficiency (hello, scurvy!) or inflammation can be caused by celiac disease. This doesn’t mean everybody who ever gets arthritis has celiac disease. But, if you’ve been diagnosed with celiac disease at some point in your life, odds are that’s a good thing to check. If you do the tests and it turns out that you don’t have it, then you were misdiagnosed. You never had it. So, no. You haven’t outgrown it. If you truly had celiac disease then, you’ve still got it now. And you will still have it tomorrow, too. You’re right, although you should also be clear that the misdiagnosis can just as easily go the other way. You’re absolutely right. I’ll add in a clarification on that. Wow, thanks for that list. It took me years to be diagnosed (I was 29 when they figured it out), because I had so few of the common symptoms. Looking at that list, though, I easily had twelve or thirteen of the less common ones.